Developed from current research and a decade’s worth of experiences assisting communities in response to large-scale disasters, Triumph Over Tragedy focuses on helping individuals and communities cope with the emotional impacts of disaster events. 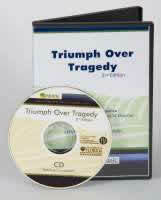 This DVD and CD training curriculum is an extension of the Triumph Over Tragedy training manual. These "train-the-trainer" materials will benefit Extension professionals engaged in disaster preparation and response, and were utilized by Extension agents in Louisiana, Mississippi, and Alabama following Hurricane Katrina.